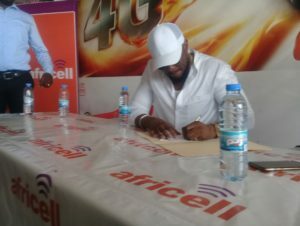 As parts of its effort to give a new face to the entertainment industry, Africell Mobile Company yesterday signed Sierra Leone’s top musician, Frederick D. Peters aka Famous as their new brand ambassador. Famous joined a host of top musicians, who became part of the Africell family as Brand Ambassadors in 2018. According to the company’s Chief Corporate Affairs Officer, Joe Abass Bangura, they decided to support the industry because they wanted to take it to another level. “We will continue to support the entertainment industry in our own little way. It is our belief that music forms part of a bigger picture in the life of many people. Music is powerful at every level because it creates ambiance,” he said. He stated that they have been driving a lot of things Sierra Leoneans have interest in over the past years, citing entertainment as one of them. He added that they have taken the lead in providing the much needed support to the music industry, especially signing up top artists as their brand ambassadors. He assured of promoting the ideals and good things of Africell wherever he goes and also urged his fans to join him because Africell is one of the best. “As from today, I have taken the responsibility of bringing on board thousands of my fans to the company,” he assured.